The culture has been fighting over brunch for the last year. Is it cool and breezy to have an early cocktail on the weekends along with your fancy breakfast foods or is it passe and lame, like yelling “SUNDAY FUNDAY” and wearing a straw trilby? Turns out it’s both. Like so many things, there are a lot of shades of grey to brunch. But you know who gets lost in all this? Breakfast. Beyond loaning its br to brunch, breakfast gets left out of a lot of conversations. I get it. I, too, enjoy alcohol. It’s a thing to have sometimes and it makes you feel ways. But breakfast is a thing to have EVERY DAMN DAY. I cannot imbibe alcohol every morning. I could try, but I’d rather not, frankly, because I have things to do. But if I don’t have breakfast, I’m in a terrible mood. I have trouble functioning. I get a headache and my limbs are all shaky and I can barely concentrate. I guess you could say I’m addicted to breakfast. But it’s okay. I have it under control. I don’t need to get help. Seriously, it’s cool. I have a crew that helps me eat breakfast to make sure I don’t go overboard and get bacon-wasted. In fact, that’s what my Patreon crew did for me at Rocky Mountain Grill. 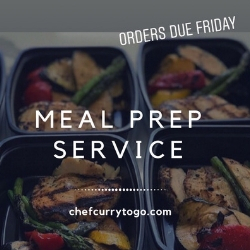 You can read about some of the lunch/dinner offerings at RMG here. Or if you’re interested in becoming part of the Patreon group, you can learn about supporting this website and eating some food with us at patreon.com/iateoklahoma. I’ve never once had a bad meal at Rocky Mountain Grill. I’ve had better meals than others, but none of them were bad. That makes ordering breakfast simultaneously easy (there are no bad choices) and difficult (it’s hard to choose when all the options are good). So study this list and hopefully it’ll lead you to glory. When you absolutely have to have everything and you want it piled on a single plate, there’s The Scooter ($9). 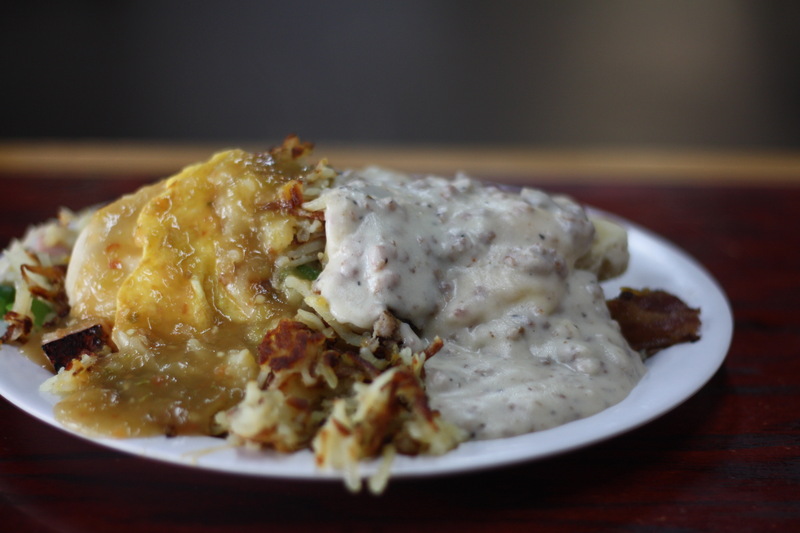 The bottom layer is hash browns mixed with ham, sausage, cheese, onions and pepper, topped with a layer of tender, buttery biscuits, then a layer of sausage gravy (or green chili sauce, or half and half) and, finally, two eggs on top. There’s also a pancake on the side, in case you’re carbo loading to haul your own casket to the cemetery before you drop dead of a heart attack. It’s a lot, is what I’m saying. It’s good, but it’s heavy and there’s a whole lot of stuff going on at once. Frankly, I quite enjoy the biscuits and gravy ($3 half order, $6 full order with hash browns) without all the added stuff. 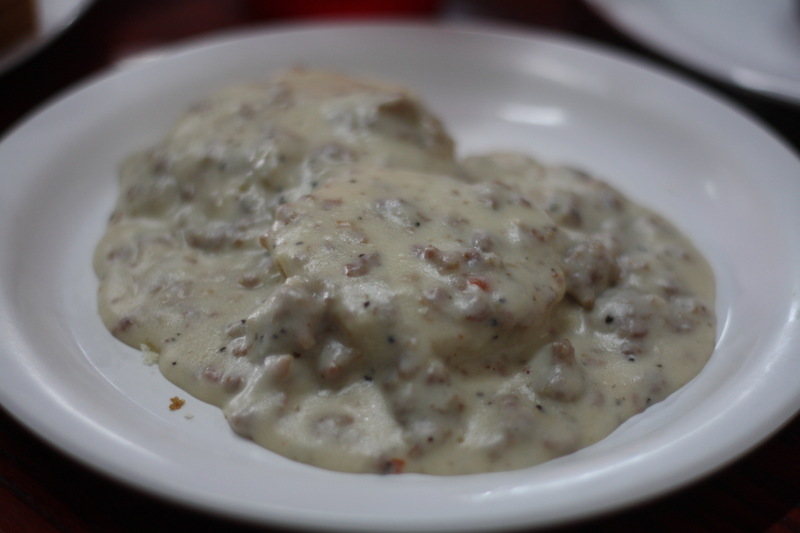 The sausage gravy is chock full of spiced sausage bits and the biscuits are soft and fluffy and buttery and lovely. They could probably be used as pillows, but then you’d have that dream and when you woke up they’d be gone. I liked my omelet ($7) just fine, but be aware that this is a diner-style omelet and not what you might expect at an omelet bar or French-influenced restaurant. One fold, ingredients in the middle. Whatever you do, choose green chilies as one of your ingredients. This place loves its green chilies. Not everybody wants pancakes as the centerpiece of their meal, which is why I firmly adhere to the Ian Karmel school of Pancakes for the Table. Get your eggs or savory skillet and everybody gets to share a pile of flapjacks in the middle. RMG’s pancakes (1/2/3 for $3/4/5) are supple and fluffy and soak up syrup like a cactus slurps up water. 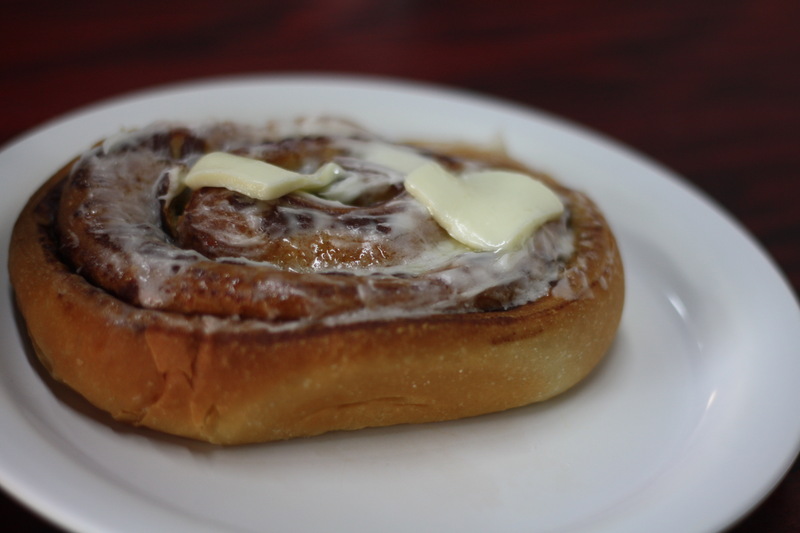 If it’s available, get the cinnamon roll. In fact, forget the pancakes if cinnamon rolls are on special. 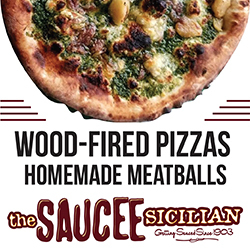 It comes with a pat of butter melting on top and it’ll make you forget all about the one you got at the fair that one time. Finally, and hearkening back to Rocky Mountain Grill’s deep and abiding love for green chilies is the smothered breakfast burrito ($6). 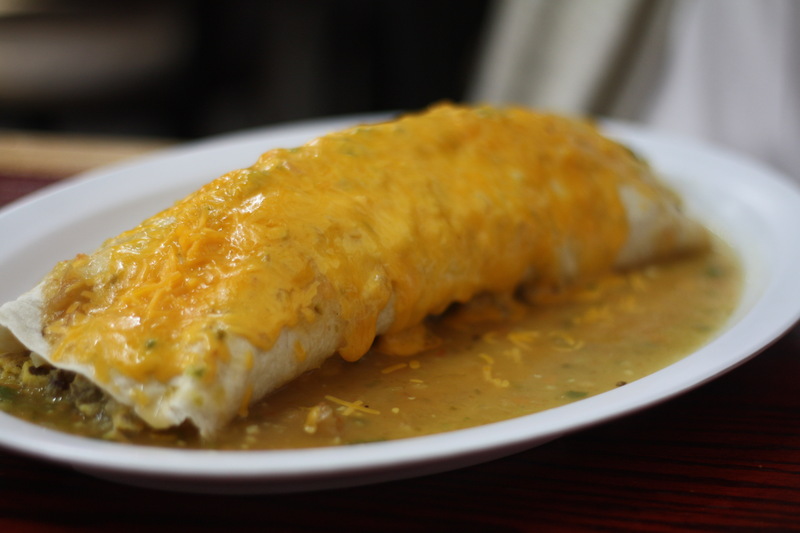 By virtue of being smothered in spicy green chili sauce, you will need to eat this with a knife and fork. Inside the big flour tortillas are sausage, bacon and cheese scrambled together with eggs, hash browns and more green chilies. You’re welcome. How will you choose between all these options? I suggest gathering a big group of people and ordering one of everything. But that’s kind of how I do everything.